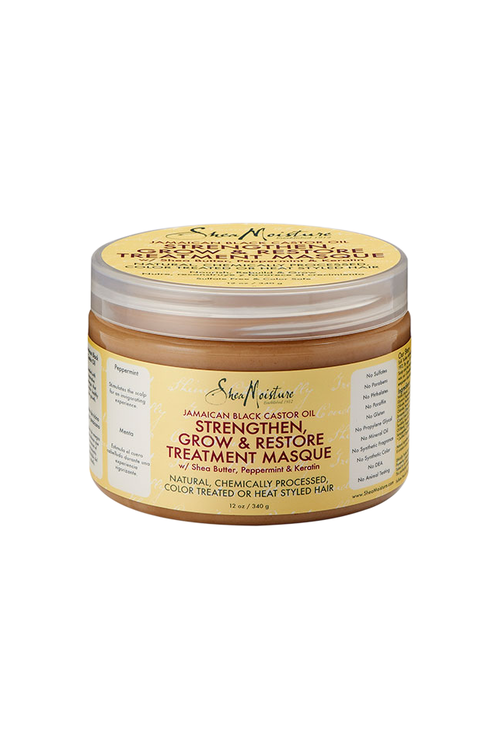 This hair treatment Masque from Shea Moisture is infused with Jamaican Black Castor Oil which is loaded with reparative omegas. Reparative omegas are essential fatty acids which nourish and stimulate hair scalp to reduce shedding and promote hair growth. Blended with natural ingredients like peppermint and apple cider vinegar, Shea Moisture’s Jamaican Black Castor Oil Strengthen & Grow Treatment Masque invigorates the scalp and balances pH levels to make your curls and coils smoother and shinier. Certified Organic Shea Butter provides a nourishing hydration which moisturizes dry and damaged curls and coils to make them smoother, shinnier and frizz-free. Shea Moisture’s Jamaican Black Castor Oil Strengthen & Grow Treatment Masque restores natural bounce and shine even to dry, coarse, color-treated hair. No more unhealthy hair and dry, damaged coils. This gentle treatment mask is the easiest way to soft, smooth, tangle free curls which look and feel incredible! Apply generously to clean wet hair. Comb to distribute products evenly to hair. Leave in for 5-30 minutes or more. Rinse and style as desired.